Northern Ireland Fire & Rescue Service has held a major multi-agency cross border emergency training exercise in partnership with Translink and Louth County Council Fire & Rescue Service in Jonesborough, Co Armagh. The purpose of the exercise was to test operational command and response from the responding agencies, on each side of the border, to an extensive railway and multiple road traffic collision incident in the border area. 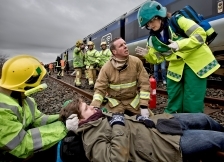 The exercise, called “Jonesborough Juggernaut”, took place on 2 March and involved a staged collision on the railway tracks, in what NIFRS Chief Fire Officer Chris Kerr described as "one of the largest railway training exercises ever held". "Exercise Jonesborough Juggernaut allowed us to test response, command, communications, tactics and interoperability between NIFRS, Louth County Council Fire and Rescue Service and Translink, as well as with our colleagues across the statutory and voluntary sectors," said CFO Kerr. "Major emergency incidents on the railways, are thankfully quite rare, but can have serious consequences with generally large numbers of casualties if not fatalities involved. Preparing and training together for such incidents is essential and builds upon the ongoing co-operation and training between NIFRS and Louth County Council Fire and Rescue Service for responding to incidents in the border areas as well as reinforcing collaboration with Translink in dealing with an incident of this scale on the railways. "This exercise was extremely valuable and there are learning points for all of the agencies involved. This will ultimately enhance interagency working between the emergency responders, both north and south, and is a vital lifeline to members of the public who may find themselves in an emergency situation on the roads or on the railways, not only in the border areas but across Northern Ireland." As part of the scenario a car crashed through a fence onto the railway track and into the path of an oncoming train. The car was pushed along the track by the train and fell off at a bridge colliding with other cars. Simulated fires on board the train combined with diesel leaking into a stream further intensified the difficulty for the various agencies responding to the mock up major incident as they dealt with multiple fatalities and dozens of casualties. Eamon Woulfe, Chief Fire Officer, Louth County Council Fire and Rescue Service, said: "This major emergency exercise has allowed Louth County Council Fire and Rescue Service to test its response to a major rail incident, which is identified as a potential major emergency scenario in the county. incidents. A rail-based emergency is a particularly difficult event for emergency services to deal with and this has been a valuable learning experience for Louth Fire Service Personnel." Granville Lavin, Group Health and Safety Manager, Translink added: "This exercise has given Translink NI Railways a very valuable opportunity to work with our colleagues in the emergency services. It has also enabled us to test and review our own preparedness and processes for responding to major incidents." Participants in the exercise included NIFRS, Translink, Louth County Council Fire and Rescue Service, PSNI, Northern Ireland Ambulance Service, the Southern Health and Social Care Trust, the Southern Group Environmental Health Committee, St Johns Ambulance and the Maritime and Coastguard Agency. • At 07:50am a car with a mother and child on board, was leaving a local scrap yard when the brakes failed causing the car to collide with a pedestrian and a car and trailer, the car then crashed through the fence at the railway track and into the path of an oncoming train heading from Dublin to Belfast. • The car was then pushed along the track towards Kilnasagart Bridge were it fell of the track onto a car with 2 passengers on board, which was travelling along the Kilnasagart Road. The train continued on approximately another third of a mile before stopping. • The impact of the crash caused a fire to start in the drivers cab of the train and it spread to one of the carriages. On board the train were 43 passengers with various injuries. • In the confusion some passengers wandered off the train and fell down the embankment sustaining broken bones and head injuries. • There was also diesel leaking from the train with the potential of running down the embankment into a small stream. • Emergency responders dealt with 2 fatalities, dozens of casualties with injuries ranging from severe to walking wounded and a further 20 uninjured on board the train.